This page currently has missing or incorrect information. Please help by providing any info you can. The Lore, which is found by interacting with Enchanting Tables, is the story-line behind MineZ. It is not officially told yet, however the Lore can be hinted at and found in various locations of the map. Some of the evidence comes together, and some still needs to be solved. 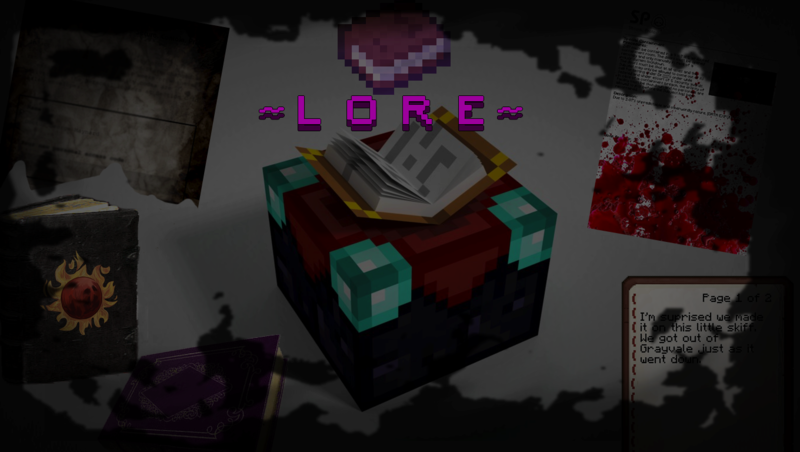 There are also books that can be found inside certain lore blocks, these are accounts by people in the MineZ world. Agni Ignis was the last stronghold of the mages, fleeing there when the plague first started, using the last of their magic to seal the city. It was originally a city created for worship of the 4 elements. With so many refugees entering the city they could not ensure that the worshipers of Dentril would not infiltrate the city. This led to the wall becoming breached and the plague overrunning the city. Before you lies the ancient temple of the god Simoon. Now it is but rubble. In times of old, this place would have been filled with magic and tools of times long gone. Before you lies the great library of Axis Mundi. Before the Sealing of Hestril and The Great Banishment, this library was part of a great city. The city of Axis Mundi was the focal point of the world. Magic flowed through the entire city of Axis Mundi like water. It became the meeting point of humans and gods. Without the gods influence on the city, these mega-structures fell apart. As the world grew more chaotic, these ruins, containing traces of magic, were spared. Without the stability Hestril provided, the four god became corrupted as well. Tyranny was introduced to the land. The four believing they should have absolute domain. The gods became ruthless, laying waste to full towns of the world. From the ashes, humans rose up. The humans revolted, beginning a war with the divine. At Grimdale, the capital of human settlements, they met. From all corners, the humans surged to this bastion. In this moment, the race of men were able to unite. Mages of all beliefs worked tirelessly crafting each spire as one would simply not be enough to contain the powerful gods. In a final act of defiance towards the humans, the gods released a plague upon the world, to serve as revenge for this horrible betrayal. Without the influence of the gods, magic drained from the world. Magic, which was deeply rooted into this world, which held it together, weakened. As the plague advanced, and the magic waned, the world began ripping apart. Great ravines began forming across the world, as it was torn. Eventually the seal will weaken, and all will be destroyed, only to be remade again. These are odd skeletons like you've never seen before. Get to the action novels! Have you ever looked at something for so long that you forgot about it? That's what we're doing right now. Some of these books don't even make sense. You wanna learn how to tie your shoes? What's that, you think to yourself? You put a lace in each hand. You go over and under again, take your loop-de-loop and pull and your shoes are looking cool! Step 1: Don't speak of Banditing. In the waning days of the great schism between Dentril and Hestril, the followers of Dentril launched an assault on the people of the world. In an effort to buy time for the civilians of the world, the Archmage of Agni Ignis, Nikoali, sacrificed herself to put up a barrier and offset the vile magic of Dentril. Her sacrifice was not in vain and allowed the four gods to seal the two away. The Giants came from lands far away, wanting the lush grassy plains to be their home... They soon came to outlive the lands they desired. Subject Z-87 was captured and contained by Byesford scientists. This creature devours anything in its path, from zombies to animals and even people. They attempted to tame this creature so it could be used as a guardian for Byesford. It takes a hero to be one of those men who go into battle. Before you lies the sacred sanctuary of Therum. This place serves as a reminder of the slow, yet powerful rage of Therum. Any who enter this sacred place directly defile the name of this goddess. The Spire of Agni is one of the sealing stones of the God/Goddess of Fire, Agni. After the gods were sealed the spires served as seals forever trapping the gods in a different dimension. They stand as grim reminders of the danger lurking from the past. Unfortunately after the gods were sealed magic dissipated from this dimension. These magical structures cannot be repaired without the tools that created them and are all that holds the gods from returning to this land. The Spire of Therum is a sealing stone of the Goddess of Earth, Therum. This spire has experienced significant damage on the protective later weakening the hold on the gods. This spire is rather fitting to represent Therum, a slow moving but extremely deadly hunk of earth wavering through the Floating Islands. When the plague began spreading, an old military order was issued to seek refuge inside the fort. Despite the harsh discipline and the preaching of the lord commander, soldiers defected one after another, either because of fear or hunger. The lack of men defending the gates soon caused the fort to fall apart. It is said that the lord still roams inside the fort, to command his army of now dead soldiers. Once part of the warm and lovely town of Frostbain, this sanctuary of Agni has corrupted and crumbled without the presence of magic. Frozen over, these tainted halls now serve as a stark reminder of the fiery rage of Agni. Arrrr, Welcome to Davey Jones' Locker! Have faith in your footing! But make haste, as your footing won't have faith in you! Arrr, Welcome to Davey Jones' Oasis! The once former capital of the human race served as the main resistance against the gods. Humans tired with being used as pawns in the war of god against god they rallied together here. With iron and steel the humans forged weaponry to defend themselves with. After the plague spread across the land The Thieves Guild fled from their home in Lost Castle to resume business below the now busy streets of Grimdale. This strange tree stands tall even in these cold times. In the past, Paluster's frozen ice plains were calm, warm waters. The tree is a great representation of Pluvia. Able to spread it's roots far and wide, it gathers all it can. But, if allowed to continue, it will spread chaotically and drown itself. Welcome to the hall of light. This place was the mage's most well kept secret. Before you is the physical representation of Hestril. Hestril and Dentril were sealed apart from each other to avoid a possible resurgence. Hestril's actual place of sealing has been forgotten. When the forces of Dentril stormed this city, the mages knew they would scour and defile it. In a final act of defiance, the mages sealed this place, and erased any memories of here. Ironically, the key to access this sacred place was thrown into the Shrine of the Dusk. Romero was the largest coastal town. It's large stone walls made it a superb haven for refugees during the original outbreak. As more people flooded the city, the possibility of infection grew. Isolated cases arose, but were swiftly dealt with. Unfortunately the bodies were stored underground, and the virus spread to the water system. The cathedral's symbol of the moon means represents the God Hestril, and his split personality. Beyond that, much has been lost. Only Legend remains. Miner's Log: During the Construction of this church, we found...something. The Rock here, it's not...it's different. We will go deeper. We've had disappearances as well. One of the miner's is becoming obsessed.... with something. He mutters endlessly... "The hands of him, they draw me closer, pull me towards him." That miner, he went crazy saying we should never have entered this cave. On a side note, the air. It's different here. The other miner went crazy. He ran into the darkness. I'm hearing whispers. They're oddly comforting. His Hands draw me closer. They pull me closer to him. He...Ordered me to do it. I... Didn't want to, but he told me to. I go willingly into the Heart of Darkness. A massive eruption that ripped the continent into pieces. The stars fell from the heavens to join us, and finally, the earth swallowed us whole. Some of the refugees have fled to the cathedral, hoping it would give them solace. As the sky crumbles, I can only hope some of us will make it. These books all seem to be written in ancient runes. Does anyone here read runes? You can't seem to make out the text on any of these books. They seem to be very old! These books contain a wonderful recipe for pumpkin pie. Construction of the Shrine of the Dusk was started 15 years after the foundation of Al Hasa. Massive quantities of stone was pulled from the Al Hasa Quarry. Documentation of similar findings were recovered from multiple mines. Similar to rocks accumulating over time, there appears to be large scale ruins everywhere. Some books were even recovered from these mines. A Beginner's Guide to Necromancy. Step 1: Acquire multiple dead bodies. Step 2: Put in the eggs. Ahhhh, you can smell it already. This Book seems to be recovered from a town called Helia. The book seems to be in bad condition. Yet, you make out the name Hestril. Recovery of skeletons from multiple excavation sites have yielded odd findings. Bite marks on ancient skeletons dating thousands of years old, and....very odd skeletons as well. Nothing like we've ever seen. For a further analysis, flip to page 44. Goats are very intelligent and curious animals. Goats are the natural enemy of little ponies. This book seems to be a guide to building better trees. You know they won't be good though. It is said, that before all else, he existed. Bound by nothing, Hestril, presided over the infinite expanse. From the darkness, he created the infinite cosmos. From himself, he created the stars. From himself, have gave life to 4 others: Gods of all elements. Agni, God and Goddess over the flames of life. Simoon, God of the wind. Pluvia, God of water and wisdom. Together, they created the Earth, and all of it's wonders. However, in doing this Hestril became corrupted. By creating the 4, he himself developed a split personality. Wherever there is light, there must always be darkness. And so Dentril became the God of darkness. The two personalities became rampant and unpredictable. Because of this, the 4 had to seal the two personalities away. Once the two were sealed, the balance of light and darkness reached an equilibrium. The entities were sealed in separate location, The mind and body of both, split. This is the Hall of Shadows. If you let your gaze drift upwards you will see it. The petrified Claws of Dentril, God of Darkness. You will need to find 3 sealing skulls if you are to proceed. By doing so, you may unleash a terrifying evil upon the land. The four Gods sealed Hestril's alter ego, Dentril here with a four pronged seal. However, to progress, you might have to remove the seal! To undo the seal, their the 3 remaining sealing skulls into the hopper. Looks like each major dungeon is dedicated to a specific God. There's a chance to get a sealing stone from each of those. Each stone must be brought, then, to the Lady. Before you is the physical form of Agni the god/goddess of fire. Agni switches between genders at will when communicating with the races of this land. His/her temper is unmatched and is well known for their wrath. After being sealed Agni now remains frozen in stasis awaiting to walk the land once more. Welcome to Tristitia, home of the "Forbidden Arts". It is here in the deep jungle of Tristitia a new species was born. Those who witnessed it's creation only know it in the necromancer tongue as "ghost". Much like a chameleon the ghost blended with it's environment, becoming unseen to the naked eye. It quickly grew out of control scaling the trees murdering everyone involved with vicious stabs from behind and a fearsome scream that echoed through the night. All records of its existence and the ritual used to create it were destroyed and the ghost was never seen again. The Spire of Simoon is long abandoned and forgotten much like the former great air temple Anemos Sanctum. Earthquakes over the years has begun to rip the spire to pieces weakening the hold on the gods. This spire carries the decoration of the symbol of air representing Simoon. The God of Wind known for being a trickster among the gods and the races of this world. The Spire of Pluvia is one of the sealing stones of the God of Water. Pluvia kept to himself deep below the ocean too involved in his own knowledge and wisdom to care about the matters of this world. Much like the prayers of the citizens of Al Hasa for water for their crops. This spire is a monument frigid as Pluvia himself drowning in his own thoughts. Here lies the remains of the once great tower of the wizards. In the time before the Great Banishment this was a place of knowledge and learning. The wizards, kind and knowledgeable helped the people of the world. Their terrestrial magic was paralleled only by that of the Necromancers. During the Great Banishment the wizards formed an alliance with those of the dark arts to free all from the tyranny of the once generous gods. Without any magic, the field surrounding the tower collapsed and caused this explosion. If you're reading this then it means my defences didn't stand a chance. The Virus is spreading! Agni Ignis has been overwhelmed. It's quiet here. Only the moans of the dead. Supplies have run out. Blood should suffice. We hope your travels to the Goddess' shrine are well. It must be different to travel so far away from home, I don't know how you do it! In turn though, we miss you greatly. It's not home without you. We arrived at this site earlier than expected. Upon inspection of the surrounding rock layer, I believe this area to not be from our time. This is the 2nd known area like this. What could it mean? I'm going out with the patrol to find her! I know I should have been the one to go to look for apples this morning! I hope that we can find her. This is the day that I have always planned for! I knew that one day the fools above would end up messing something up. It's a good thing that I have always worked to horde all of the materials I need down here. I have 20 bowls of delicious mushroom stew standing by in case they are ever needed. And if those ever run out I am working on getting an endless supply of bread.....more research is needed. I've finished my work on the underwater storage facility, no one will ever find my work. My work may get wet nut it will be safe. 58 Golden apples and counting. Not sure what I could use these for, however I'm sure if I wanted to run anywhere without getting hungry I would be able to do so. I have no fear of dying of dehydration as there is fresh water all around me. A man came down into the cave today to search for food. It was a fatal error to enter my cave. Oh well, more food for me. I have spent the last month making spreadsheets by hand cataloging all of the materials that I have. I am prepared for whatever comes next! I'm going to stop documenting what is going on for a while, quite a bit of entertainment down here. I've spent some time thinking, I think I might try going outside later, I will make a plan to do so. Sorry I haven't made a log in a while, I made some friends on the surface that I could share my stuff with. As it turns out friends are okay. As long as they don't take my health potions or sugar. It's time for me to leave this log behind. To the person that finds this log, this cave provides everything that a person may need, except for other people. To anyone it may concern. The doors in the lab have malfunctioned, they've gotten loose. Anyway, you need to take it slow, or your friends may get locked on the wrong side of the door with those... Things. A new vaccine is ready for testing, unfortunately, cattle numbers have become thin. We will need to locate a new animal type for testing. Baxter has gone in search of pigs. Testing of the new vaccine should commence in the coming weeks, if all goes as planned. Milk has been proven to cure infection when given to human who hasn't turned. The undead have shown no signs of regaining human traits when given vaccines with milk. Vaccine A-12 was administered to Subject Z-87 under close observation. Subject entered an enraged state and attempted to break containment. This continued for 3 hours before subject fell over unconscious. Dr. Philips has forbidden any further testing with A-12. "These vaccines are not helping with it's behavior. We need to start from scratch." While conducting an autopsy on a recently deceased pig, I noticed something strange. It's decaying skin began to regenerate when it came in accidental contact with Aurum. After some further experimentation, I've discovered that Aurum will also regenerate the cells of an infected subject, although the effects are only temporary. I will forward these results to Dr. Hudson. Description: Defensive measures against potential containment breaches. We've learnt a great deal from this mysterious new dimension accessed through this portal. Our excavation team has brought back a considerable amount of an unknown white crystal found within the hot surfaces of the cliff sides. Mining and extracting these new materials has been quite difficult given the unusual terrain of the dimension. Even, there is so much we can learn from this dimension and so much we can do with these new materials. Once all the correct buttons are pressed, the torch above this shelf will light up. Sector D-10 Door has broken. Go to the boiler room over by Incubation and fix the fuses. Then head over to Water Control at the Workshop and reconnect the pump line. Then the board will need to be reconnected to the main grid at the storage area below. This should fix the door, good luck. Subject displays signs of of notable anxiety to it's surroundings. Subject shows loss of pigment in head and lower regions. Subject shows increased hostility and has attempted to break down cell door. Subject has grown more violent and resists sedation. Footnote: Door has received several dents, door will need to be replaced. Subject now looks more pig than human, a noticeable snout now covers the face, and skin is almost entirely pink, although the body still shows signs of decay. Subject continuously rams his door. Food is running low, Jason isn't looking good and is becoming dangerous. We've stashed some military gear where he can no longer reach it and we may abandon this base later this week. We've just gotten word that south of here there are strange reports of people dying and then coming back to life... what a silly thing to say! At last, I've discovered the secrets to the cosmos! A portable hole that leads to a pocket dimension. Does Consilio even know what this could mean? Endless energy, instant travel, limitless wealth! Sure, there's a bit of interdimensional leaking (some of my walls might be turning a nasty shade of maroon), but it's a small price to pay for such power! I've actually come to like the new bricks in my abode. For awhile I thought the red would look tacky, but now the entire place is red and it befits the hue of the portal. I should start inviting more people to see the project. Professor Markov has gone completely mad. He invited me over to show off his newest discovery, but when I arrived, Markov barely looked human. I managed to knock him unconscious, but his entire genetic structure looks different, alien. I'm ordering a quarantine of his manor (or what's left of it), and transporting him to Castle Byesford. The labs over there could find a way to reverse this... transformation. That's all we can do now. We thought we'd be helping, but all we did was repeat history. Now we will be buried, and forgotten. Beneath a gate of purple, marked by the sun. Shortly after the discovery of Dentril's location, odd pillars with an almost outworldly gleam appeared. This location seems to be much older than we anticipated. We're not sure how stable this structure is. This language seems to be something far more archaic than anything recorded in the great library. Too many anomalies have surfaced since Dentril was uncovered. I have a hard time believing any of this happened by chance. Based on our research, the pillars draw their power from a location called the Origin. Throughout our testing, any item returns only a whisper. The end is a "d" note... It's the [OBFUSCATED] yellow mushroom in the cluster, looking at them from the north. I've come so far in deciphering it all... I can't stop now. The mushrooms connect through a localized underground root system. They respond very well to water, and share it to one another when added at the base. They also seem to take on more water even after they've fully grown, storing it at the base with a noticeable drip once it's full. However, the mushrooms stop accepting water when there is weight on top of any of them. The humans managed to stop fighting long enough to banish the monster down to the tunnels. What were the mages thinking... using magic on a wart toad?! These tunnels couldn't have been unsealed at a better time! It was quite an interesting day in Kaocho. A small rowboat came from the east. The man in the boat seemed quite peculiar, raving about the longlasting benefits of mushroom farming. He said he came from an island where fungus enveloped the entire landscape. I have buried the last of our great hideouts. Our discoveries, our secrets. No one should know what could be. Here at the bottom we've hidden from the dead that are on a rampage to destroy the world above. We've lost the main gate to the fortress, alongside several guards inside the watchtowers. Their screams will haunt me 'till the end of my days. Longton has demanded we raise the drawbridge, but that would mean cutting off the rest of the garrison. Those poor men will have to survive on their own. The mission is fruitless. Longton is dying, and my men have all but taken arms against me. I refuse to order the rest of them to die. A few of us have taken turns digging through the northern watchtower, and we're nearly to the bottom of the cliff. Before we leave, I'm going to get those men out of the garrison, if it's the last thing I do. I just ordered Willis to send a word for a doctor. This cough won't let up, and I'm certainly not feeling up to moving. These men seem to want to abandon this place, but that's out of question. Willis needs to stop questioning my judgement, now more than ever! Sure, we just lost the garrison, but they're holding their own and diverting the horde. Once the doctor gets here, he'll see the situation and call for more soldiers from Worthington. We'll be out of this mess in a few days. I seem to have stumbled upon some kind of crypt! Zombies were everywhere so I climbed to the top of this tower. It was very tiring, but luckily this beacon seems to be keeping the undead at bay! I've decided to rest here then go for a little tomb raid and see if there's any loot to be found here, hopefully some fancy swords, my scimitars seen better days! Wait, here engraved in the skull reads "Along the dining table in the great hall of Thannus, lies a keyhole to unlock the secrets of this town..."
Now I just need to get out of this Tomb. Our small town has defended itself by taking advantage of the extreme cold that freezes over our lakes and fishing for what we need. The cold seems to be our largest enemy, we will have to move past this village in order to get somewhere with a more suitable environment. If only we had an impenetrable bunker to live in. People don't just disappear without a trace, where are they vanishing to? We don't have much here, but what we do have we share among us all. Jeff got sick today and is staring at me with a hunger only the living dead can have. We're taking a vote later tonight to decide what should be done with the outsiders that pass through the town. We have endured here even though the apocalypse seems to have come. Although we are surrounded by the undead the water that separates us from the continents is keeping us safe. We have elected to keep from venturing to the mainland in order to avoid contracting the disease that afflicts all that it encounters. On a lighter note, Gary says that while on his fishing trips he has seen what look to be huge shadows on the ocean floor and I predict are large group of fish on the bottom coming close to the island everyday! We should have a fresh supply of fish soon and we can stop rationing food! We've kept up practice in case we need to leave the island to procure supplies for any reason. Our garden supplemented by our accommodating climate have left prosperous compared to the rest of the world. We were always ones for seclusion and thankfully that has come to help us. As long as no one can find a way in over the walls we should be fine, someone would have to climb into a window in the tower in order to gain access to the gates keys! Recently, we've been receiving more and more demand to move all harvests to Romero for refugees. How will other towns fare, if they do not recieve their shipments? As we have docked here in the city we have come to find it overrun with citizens who have contracted what seems to be a plague! We will ship out in the morning in order to locate a better port with more gold! We hit a northern wind and we found this glorious suspended city after spotting it from the ship! We approached the entrance and were turned around by it's inhabitance. As we see no other alternative we have decided to leave. We have no intention of leaving this city unscathed so we are firing a corpse over the walls to see how they feel about their choice as we continue north. Even though we have plenty of rations on board, I sure wish this city had some gold for us! We've struck land! The islands around here seem to be scattered like dots on a canvas. We are going to stay here and build a base that can get us started as we get back to full strength. There is a base north not far from here that seems to have deserting troops that we may try to coerce into joining out ranks. I think Sir Geralds lost his mind. We can't continue researching like this. I'm surprised we made it on this little skiff. We got out of Grayvale just as it went down. I've salgaved all I can from this, but I'll leave some behind for others...and there will be others. You've crashed into an iceberg near the Arctic Circle. The captain was thrown overboard and didn't make it, leaving you stranded with a frozen wasteland before you. Agni is the name for the Hindu God of fire. Simoon (Or Simoom) is actually the name for a strong local wind that blows in the Saharan desert. Pluvia is the Latin for "Rain". Anemos Sanctum means Sanctuary of Wind. Anemos is Greek for "Wind" and Sanctum is Latin for "Sanctuary". The Ghost metioned in Tristitia's Lore block is the Ghost from Ghostcraft, a gamemode made by ShotBow Network. Tristitia is Latin for "Sadness". It is also related to describe any kind of negative feeling, which perfectly depicts this location. It is involved with dark arts and haunted places have an aura of negativity surrounding them due to the horrible events that took place in them. The Lore Block from Ghost Fleet references to a legendary pirate from sailor stories. Davy Jones' Locker is the "nickname" to the death in the sea. The impenetrable Bunker mentioned in the Paluster Lore Book is a reference to the Admin Bunker nearby. The Lady mentioned in Sirus's Lore Block refers to Cave of the Dead Lady. Most of the terminologies and events mentioned in Aurora's Lore Book reference the playstyle, common occurences and game mechanics of the MineZ world from a player's perspective. There's a skeleton skull sitting in the Forest northwest from Aspermont, exact location being -2991, 70, -2290. This is a reference to the Lore Book found there. The King of Red Lions is a reference to 'The Legend of Zelda: The Wind Waker'. The Professor mentioned in the Death Mansion Lore Book, Professor Markov, is Andrey Markov, a russian mathematician who researched in probability theories, known mostly for his stochastic process theory. ACrispyTortilla, IvanDoomy, ChipmunkHunk and 6 others like this.